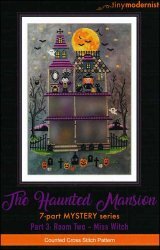 The Haunted Mansion Part 3: Room Two - Miss Witch [H1822] - $2.00 : Yarn Tree, Your wholesale source for cross stitch supplies. Cross stitch pattern from Tiny Modernist. Knock Knock..who's there?!?! "Miss Witch," has appeared in room 2 of the haunted house! She is stewing up her dinner in her black cauldron as the cat keeps watch close by. Mr. spider looks like he has arrived just in time for dinner! Who shall appear in room 3 of the haunted house? This is part 3 of the 7 part Mystery series. Stitch count is 156w x 224h for the full design.